No matter who you are, there’s one type of presentation that you will definitely have to perform well at some point in your life: an interview. Most people forget that an interview is a kind of presentation, but you are pitching yourself as a valuable asset to someone else; if your presentation isn’t convincing, you won’t get the job. This particular presentation is potentially the most important presentation you will ever give since how you present yourself in front of a potential employer can make or break your career. That’s why we’ve put together 3 common mistakes people make during an interview and how to avoid them. Mistake #1 – Showing up on time. You probably read that and thought to yourself, “Wait…. This has to be a mistake. That should read ‘NOT showing up on time’.” But you read it correctly! That’s because showing up on time for an interview actually means you are late. Your presentation starts the minute you walk into your potential employer’s building, and showing up at the appointed time conveys that you’re only willing to meet minimum expectations. Being on time for an interview actually means arriving around 10 minutes prior to the scheduled interview time (but no more than 15 minutes early). This will give you ample time to find the office, use the restroom to do final grooming touch-ups, and settle in before the questions begin. Showing up 10 minutes early communicates to your audience — the interviewer — that you value their time and are serious about the position. Mistake #2 – Not doing your research. Just like with any other presentation, research is paramount when it comes to an interview. An employer is looking to see if you care enough to put in the effort ahead of time. By researching the company, it allows you to work the company’s vision and mission into the answers you give. It shows your potential employer that you care about them and believe in what they do. Learn what they are looking for and use your experience to show that you are that person. Taking time to research the company beforehand allows you to present yourself as a great fit for their company in an educated manner. Mistake #3 – Over or under dressing for the occasion. The way you dress says a lot about who you are. One mistake interviewees often make is not dressing correctly for the company they are interviewing with. Just like in a traditional presentation, it is important that you dress for the audience. If the company you are interviewing with is a jeans-and-t-shirt type of company, then you don’t want to show up in a three-piece suit, or it will be clear that you didn’t research the company’s culture ahead of time. Similarly, if the company seems to have a more formal and professional atmosphere, don’t show up in jeans, or you’ll look sloppy and unfit for the position. When it comes to selecting an outfit for your upcoming interview, research the company’s dress code is and dress 1 step above that. This shows that you understand and can fit into their culture, but by dressing a bit above the standard, it shows you recognize the importance of presenting yourself in a professional manner. Also pay attention to the interview agenda so you know what shoes to wear. If you’ll be walking a lot or touring a factory or construction site, make sure you wear appropriate footwear to stay safe and comfortable while maintaining the appropriate style of dress. Presenting yourself during an interview is a process everyone must learn to master, because it’s inevitable that you’ll experience one or many in your lifetime. 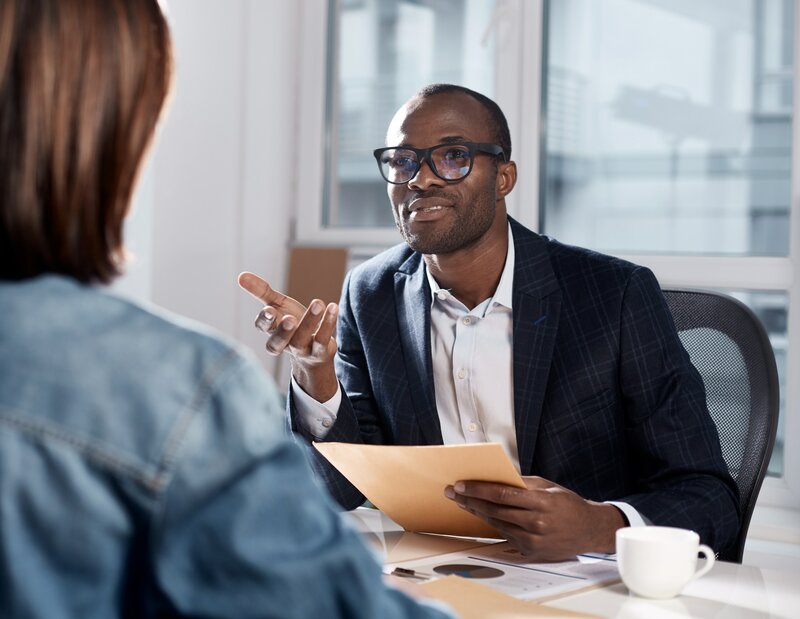 Though it may not be a traditional presentation you learned in speech class, the basic principles still apply, and if you can learn to avoid these three mistakes, you’ll be able to wow your interviewer and land the job of your dreams. Looking for more information about how to level up your presentation skills? Check out the Presentation Mentor online course today!